The Fourth Judicial District Commission on Judicial Performance unanimously (10-0) recommends that Judge David A. Gilbert BE RETAINED. 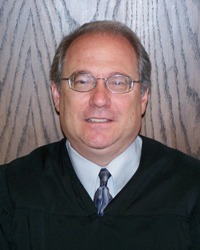 Judge Gilbert was appointed to the El Paso County District Court in July, 2001. Prior to his appointment, Judge Gilbert spent two years in private practice, then joined the El Paso County District Attorney’s Office as the Deputy District Attorney. He also served as Chief Deputy District Attorney, and was responsible for the management of the criminal division and the homicide prosecution unit. Judge Gilbert graduated from Queens College (City University of New York) in 1980 and received his law degree from the University of Denver in 1983. Judge Gilbert is a strong believer in community service and speaks to school and community groups regarding the judicial system and also serves as a Judge for high school mock trial competitions. The Commission conducted a personal interview with Judge Gilbert, reviewed several of his written opinions and self-evaluation, reviewed survey responses and comments from attorneys and non-attorneys and observed him in Court. Among the survey questions was “How strongly do you recommend that Judge Gilbert be retained in office, or not be retained in office?” Of the forty-six attorneys completing the survey, 84% recommended retention and 11% recommended non-retention, and 4% made no recommendation. 88% of the forty non­attorneys completing the survey recommended retention, 2% recommended non-retention, and 10% made no recommendation. Judge Gilbert's docket during this term has included civil, domestic and criminal cases. Results from the attorneys surveyed showed Judge Gilbert scoring above the average of all District Court Judges standing for retention in all five areas surveyed; non-attorneys surveyed also rated Judge Gilbert above average of all District Judges standing for retention in all five areas surveyed. The Commission asked Judge Gilbert what he thought his areas of improvement could be, and he stated that he was aware that at times he talked too much. This was validated by written comments submitted by both attorneys and non-attorneys on the survey. Judge Gilbert believes his primary strength as a judicial officer is to make sure that everyone appearing in his Court is treated fairly and equally. As part of carrying out this duty, Judge Gilbert strives to provide all parties with a full and complete understanding of the Court’s procedures and the reasons for his decisions.